(Mens XL) Ugly Xmas Sweater! Xmas Stuff & Plaid! Rocking Horse, Wreath, Tree & More! Home > Ugly Christmas Sweaters > All Ugly Xmas Styles > (Mens XL) Ugly Xmas Sweater! Xmas Stuff & Plaid! Rocking Horse, Wreath, Tree & More! 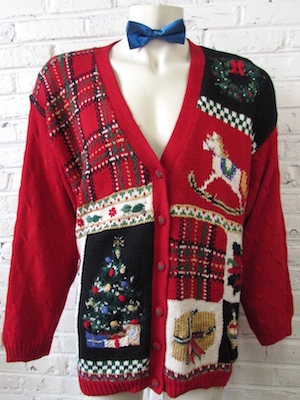 Ugly Christmas sweater cardigan! Red knit sweater with white and black patches filled with fun Christmas stuff! Rocking horse, wreath, poinsettia, tree, candy cane, present and ornaments! Wowza! It�s all here in this incredibly ugly sweater! Oh, did we mention there are blocks of plaid! Sweater is embellished with gold colored beads, plaid bows, gold and silver sparkle knit! Closes in the front with red and green knit covered buttons. Has shoulder pads, easily removable.Tagged by Heirloom Collectibles Women. Ramie/Cotton blend.